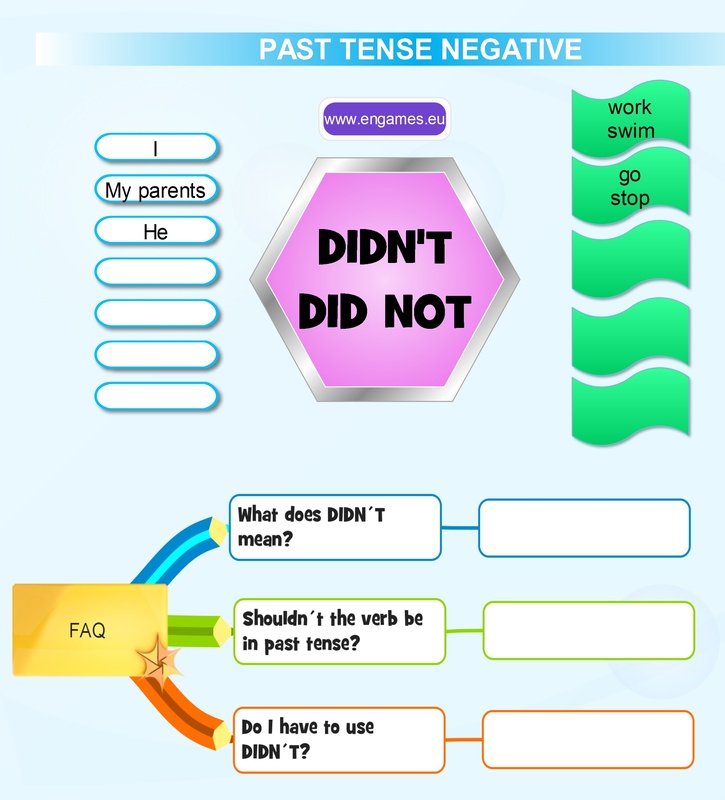 I have already published several posts on past simple tense. There are several posts on irregular verbs, a post on regular verbs in past tense and now I would like to explain how to make negative sentences in past simple. It is quite simple – you just add DIDN´T and the infinitive. To help you and your students absorb this concept there are two games and a graphical explanation. In this short video a man ends up in prison because his grammar is bad. The aim of this video is to introduce the basic forms of negatives in past tense. 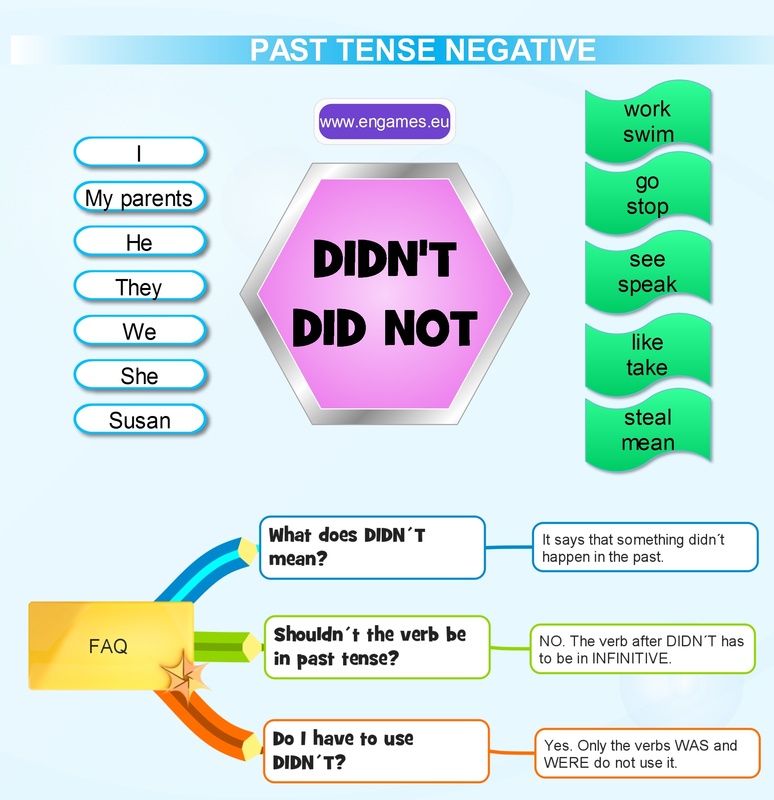 In this mind map you can see how the past tense negatives are formed. There is the explanation and below there is a mind map depicting three frequently asked questions and their answers. If you are a teacher it might be a good idea to let the students deduce the rules and complete the table. However, beware that this way of teaching is not suitable for weaker students. I firmly believe that practice makes perfect. If you practice the things you will understand the things better. That is why I think that students should go through the following games at least twice or three times. The first game is in HTML5. Your task is to choose the correct form and if you pass the test you will play the game called Tower defence. This game will play on all mobile devices. The second game will play only on your desktop. It is called a Penalty Shoutout and once you choose the correct option you will get a chance to kick a penalty. Will you score all ten penalties? Good luck. Can we say: I didn’t do and steal it? No. You have to say: I didn´t do it. I didn´t steal it. One of the tests was a sentence….”Me and my friend…”. With this fundamental error I can’t use this exercise for my students. Otherwise it is great ! When I was at school we learnt My friends and I too. But no one uses this. Everyone says Me and my friends.